One of the greatest kicks I get out of travelling to the many different countries in Europe is trying the local drink on offer. Whether it’s port wine in Porto, whiskey in Scotland or trappist beer in Belgium, I like taking a break from cruising round town to get my imbibe on and meet the locals or other travellers over a drink or five. I decided it was time to put together a list of my favourite beers from around Europe. After two years gallivanting around the place, I’ve come up with a decent cross-section of lagers and ales that I really like. Sagres is a lager hailing from Portugal. I first had it in Lisbon and found it to be one of those beers that you can really knock back easily on a night out or on a warm afternoon in front of a cafe somewhere. It comes in its own distinctive glass as seen below and you can get it in almost every bar and pub in Portugal. Sagres is a beer you can get outside of Portugal as well, and your best bet will be in Brazilian restaurants or London pubs with a more discerning lager variety on tap. I came across this little beauty in Barcelona in 2010. 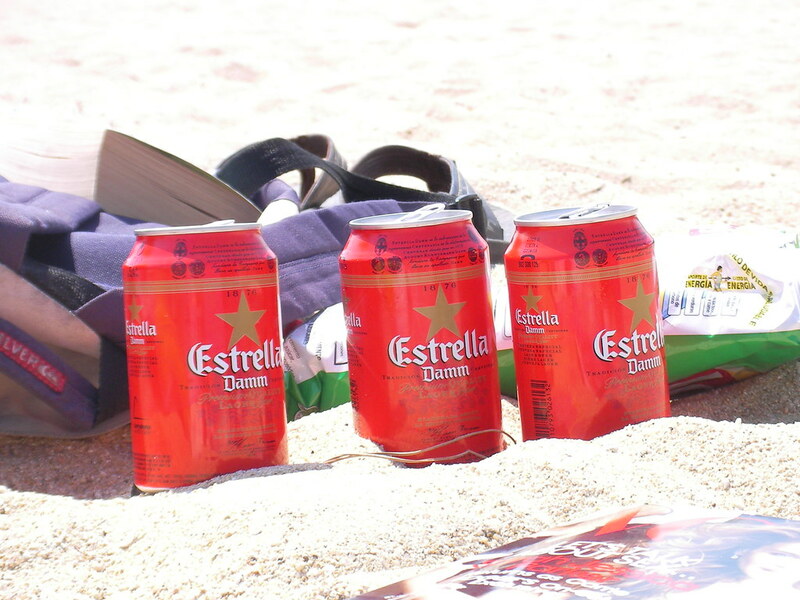 Estrella (pronounced “es-trey-ya”) is a smooth and refreshing pilsener. There seems to be a trend forming here of beers brewed down on the sunny Iberian peninsula doesn’t there? Photo courtesy of frenji on Flickr. It comes in small red cans in its homeland of Barcelona, Spain and is the perfect companion when watching FC Barcelona thrash everyone there ever was in football. Since returning to the UK, I’ve found you can see it on tap alongside other lesser known beers in some of the more niche London pubs in places like Islington. Hailing from Belgium, Chimay is one of the strongest (ranging from 7% to 9%!) Belgian beers around. It comes in 3 different varieties – Blue Cap, Red Cap and Triple and each has their own individual taste. It’s one of only 6 beers that can be called a Trappist beer, which is a beer that is brewed only in a Trappist monastery by dedicated monks that give back all the money they earn to the community. It hails from the Chimay region in Belgium and the picture above is of some Chimay Blue Cap I tucked into on my first visit to Brussels back in December 2009. Chimay isn’t easy to obtain in most parts of the world (and is, as a result, pretty expensive) but in Belgium you can pick it up at any convenience store. Probably best not to smash back half a dozen at these, unless you like finding yourself passed out in the snow somewhere. A friend and I enjoying a Leffe in Antwerp, Belgium. It also comes in a dark variety that is a lot heavier to the palate than the blonde, but both are still pretty strong as per Belgian standard, coming in at around 6%. Leffe in general traces its roots back over 800 years and originated in the Abbeys of Southern Belgium. Not sure what it is with Belgians and monks brewing super strong beer hey? Seeing as it’s the season for Oktoberfest, it seems rude not to mention one of the most consumed beers available at the event. Hofbrau is one of the widest known Bavarian beers you can get, and their tent at Oktoberfest is the largest. Here we can see it served up in a one litre mass in the Hofbrau Festhalle at Oktoberfest. For a beer served in such epic volumes, it has to be easy to drink. You can also sample it at one of the many Hofbrauhaus around the world. I think I first tried it in Hahndorf, South Australia a few years back. Little did I know how much more of it I would be swilling in Germany not long after..
Who has tried the beers I’ve listed and what do you reckon? Do you have a favourite I haven’t mentioned from a country you’ve travelled to? You’ve summed up the psyche of European beers pretty well mate – these are all personal favourites too. That’s a great list, all fine selections. I’m not a huge Heineken fan, but if you can get it on tap in Amsterdam its remarkably delicious. Make sure you check out altbier if you’re ever in Düsseldorf. Comes in small glasses – is brewed on the premises in a couple of places. Goes down far far far too easily. Very occasionally available in London in specialist bars. Sounds like one I need to try then! Thanks for the suggestion Jonathan. It’s interesting how beer can taste different in different counties and if it’s bottled or out of a tap isn’t it? Hi Justin, Tasted the last 3 beers in your post. Of those my preference would be Chimay, which is still made in a Trappist Monastery. Of the Munich beers I prefer Augustiner or Paulaner. Leffe is made by InBev on an industrial scale in the Stella Artois Brewery in Leuven. Sure it tastes OK but how natural the process that created the taste is is open to debate. My favourite beers are Brains SA from the Brains Brewery in Cardiff which is still family owned, Orval from the abbey in Belgium and Boon kriek when I want a refreshing drink on a hot day. Definitely hear you re: Augustiner. We were in Innsbruck in late August for a conference and drank loads of it, tis a quality Bavarian drop. Thanks for your other suggestions, have heard a fair bit about Brains but not tried it yet. I find your selection strange. You go mostly for rather blend industrial beers. There is so much more than that. I can find me only in your choice of Chimay. That are very nice beers. Did you try the other Trappist beers? There are so many wonderful beers. We were last month on a small festival in nothern France (Meteren)and there was not a single beer we had tastes before. My favorites are: Rochefort 6, Rodenbach, Amstel Bok, de Koninck, Witkap Stimulo, Gulpener Bok. All beers easy to drink with not to much alcohol. Thanks for your comment Joke, there are definitely lots of wonderful beers. 🙂 I have tried one other Trappist beer, Westmalle which I enjoyed. Appreciate your beer suggestions also, I’ve never heard of any of them, I’ll have to seek them out. The finest tasting beer I’ve ever tried is Krušovice (Černé) (dark one). I’ve heard of Altbier also, I should definitely try it when I go to Dusseldorf. Great selection Justin. I’m absolutely enthralled by the quality of Belgian beers – highly recommend a trip there to anyone who loves beer. I would definitely add Rochefort, Westvleteren and Hoegaarden to your list. Am definitely a fan of Hoegaarden. Great for outside during the summer.